Our townhouse is one of only 18 units, all privately owned, in the intimate Cannes Village complex. Our home is a 3-bedroom unit utilizing the coveted 1st and 2nd floors in our 12-unit building. No extra stair climbing up to a 3rd and 4th floor unit! Our well-maintained home includes a 2nd floor master bedroom with king size bed, connecting bathroom, balcony and flat screen TV. The upstairs guest bedroom features a Queen size bed, flat screen TV and connecting bath while the downstairs guest bedroom has 2 twin beds, no closet and separate bath with walk-in shower. The Great Room has a 49 inch flat screen Smart TV and a variety of DVD's, games, puzzles and books. This unit has security gates for added safety. We provide a free dedicated WIFI internet connection in the unit. The patio off the Great Room overlooks the pool, beach and ocean and is complete with table, chairs, chaise lounge and gas BBQ grill. We also provide beach towels and canvas beach chairs. There is a $100 cleaning fee and a refundable $500 security deposit required. This is a quiet restful place conveniently located next door to the Island Seas Resort which offers many activities such as volleyball, jet ski rentals, bar and restaurant. Also at the Island Seas you can rent cars or sign up for deep sea fishing. Port Lucaya Marketplace is a short 3 miles from our townhouse and has many restaurants and shops plus nightly entertainment in the square. The nearest grocery store is Solomon’s in Seahorse Shopping plaza about 3 miles away. We’ll share our favorite dining spots and site-seeing activities. There are restaurants and bars within walking distance down the beach. Enjoy Happy Hour and the hot tub next door at the resort. Before you leave our home, be sure to sign our guestbook. You’ll see pages of testaments of the many visitors, and repeat visitors, we’ve hosted over the years. We’ve heard many times that the photos don’t do the views justice. From our family to yours, we invite you for a vacation you will remember forever. Contact Judy or Bob now to reserve your spot in paradise. Tropical weather, sights and sounds await you in a peaceful setting. Wake up to a spectacular ocean view right from the master bedroom balcony or patio while enjoying your morning coffee. Take a stroll on the beautiful beach, in either direction, spotting shells nestled in the sand or ships in the distant horizon. Snorkel right off the beach and see a whole new world underwater. Lounge on the beach or poolside on our beach towels or beach chairs. Go deep sea fishing and grill your own catch-of-the-day right on the patio’s gas BBQ grill. Watch a Bahama sunset with a tropical drink in hand. Fall asleep listening to the waves come ashore. We never get tired of it. A large variety of DVD's are available. Hot tub available at Island Seas Resort next door. Perfect spot right on the beach. Next door to a full service resort and beach lunch/dinner options and bars to the left and right on the beach. The grounds are well maintained and the unit was clean and everything worked. Always have a breeze blowing so it was nice to sleep with windows open to hear the ocean! No issues with check-in our check-out and good directions provided by the owners on the process. Inside is a little dated from a décor standpoint and the kitchen is small, but your not going here to stay inside are you??? We were hear with 2 other adult couples and there was ample room to hang out at night. We would rent here again. Thank you for the review. We are happy you enjoyed your stay and would like to visit again. The condo was clean and very comfortable. We enjoyed the view of the grounds, pool, and ocean from the master balcony. The beach was clean with just enough shells and small aquatic life to make it fun for the kids. Everything we needed was already in the condo except fresh food. Thankfully the grocery wasn't far away. The neighbors and manager were friendly and helpful. It was truly a relaxing vacation for all of us- even Mom. Stayed in December 2018. Great location. Great 3 bedroom, 2 floor apartment. Had everything we needed. Since there was a high tide, we used the beach at Island Seas Resort as the beach right off the property was nonexistent (no sandy part). The Coconut bar at the Island Seas Resort was surprisingly good. If I had to find something to complain about, it would be that the property didn’t provide a beach umbrella - but we could have bought one if we really needed it. I had a beach tent for my 7 month old so we were fine! The property had beach chairs which were great! Ate at Agave one night - delicious! Owners are great - can’t go wrong renting out this place. I hope to come back one day!!!! Your welcome. We are so glad that you had an enjoyable time and that you will return to the Bahamas again. Property was very clean and the manager was very nice. Had a little hiccup with the cleaning fee but the owners more than made up for the mistake. Could not have been happier with their response. Grown grand kids loved the ocean and the pool. Have rented from VRBO before and always happy. 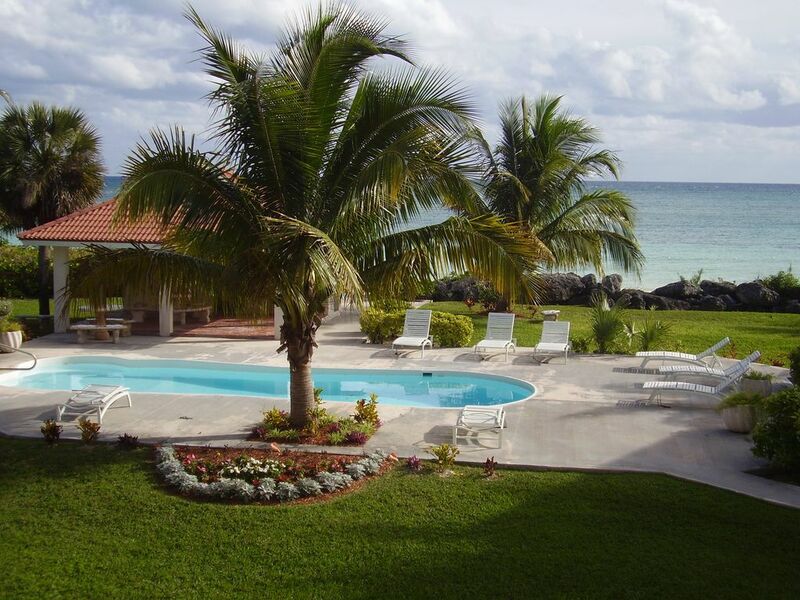 This house offer great amenities and close proximity to Tru Bahamian type food. Just right down the beach a hundred yards from the house is a beautiful restaurant in both directions one at the resort and one right on the beach. We enjoyed our time and we're sad that we had to leave. We are so happy that you enjoyed your stay and would love to have you back. Thank you for the nice review. Rates are based on 2 person occupancy. Cancellation Policy: 50% refund if canceled at least 30 days before arrival date. 100% refund if canceled at least 60 days before arrival date. Service Fee fully refunded on cancellations that qualify for 100% refund.